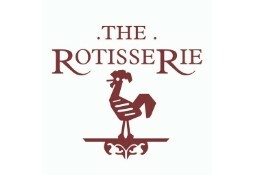 The Rotisserie is currently closed for delivery and it will open at 11:00 AM today . With cream cheese and dill, served with potato wedges and sour cream dip. Pieces of breaded tiger king prawn, served with freshly baked bread and salad leaves, choice of one of the following sauce, sweet chili sauce, garlic sauce, hot sauce, caesar sauce. With mozzarella di bufala, sun-dried tomatoes and extra virgin olive oil, served with potato wedges and sour cream dip. Three cheese & spinach bread, served with potato wedges and sour cream dip. 2 rolls breaded chicken breast, garlic butter, herbs, served with mashed potatoes and broccoli. 2 pcs of chicken breast sautéed with butter & lemon served with carrot, green beans. Grilledtwo succulent strips chicken breasts joined. With pickles, tomatoes and garlic yogurt sauce, served with french fries. With cream cheese and dill, served with french fries. With tomatoes, lettuce and mayo, served with french fries. With sun-dried tomatoes, basil pesto and olive oil, served with french fries. With sun-dried tomatoes, lettuce and mayo, served with french fries. Chicken escalope, lettuce, tomato, brown sauce and mayo, served with french fries.